We offer three modification/upgrade options for the CAD GXL2200: replace the capsule with one of our premium large-diaphragm models, and/or replace the audio circuit with either of our our field-proven kits. The two circuit kits offer two different flavors: one is transformerless, clean and pristine, with high output and low distortion. The other is a transformer-coupled circuit that injects a healthy dose of 2nd harmonic content to give you a ton of tone and vibe. The budget mod option is to either replace the GXL2200's capsule with an RK-47, keeping the stock circuit. The mic will sound better than new. Then, when you're ready to transform the mic into something incredible, circle back and build one of the circuit kits. The 32mm K67-type capsule in the GXL2200 is not a good match for the mic's circuit. We recommend replacing it with one of our premium large-diaphragm choices. If you choose to install the MP-V57 transformerless circuit, you could opt for a more brightly voiced capsule like our RK-87, to achieve alternative sonic colors. 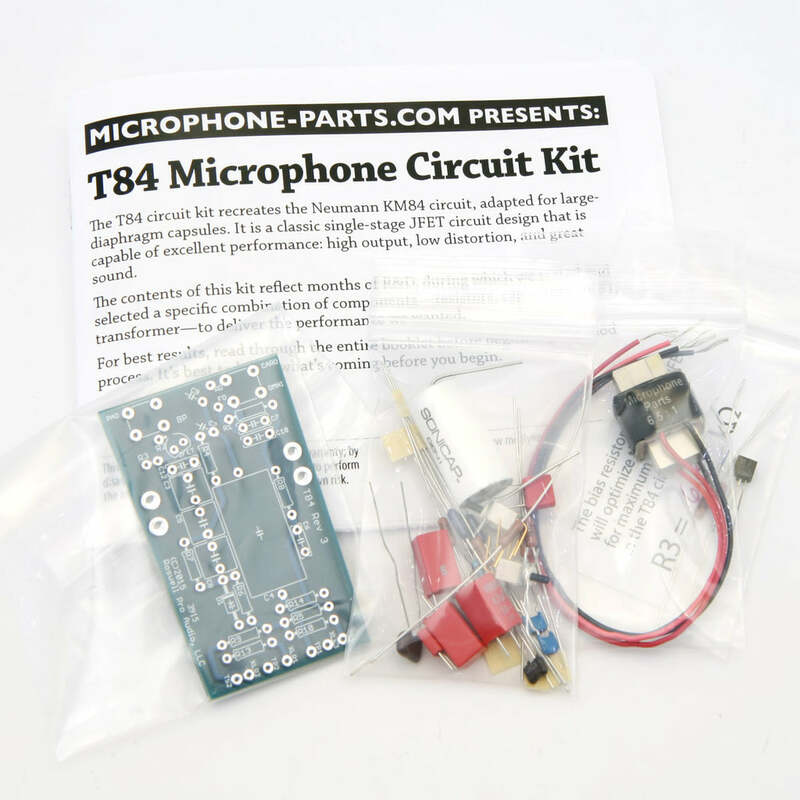 The T-84 circuit kit is based on Neumann's KM84, adapted by us for large-diaphragm capsules. We retained Neumann's magically simple audio path, but improved several other aspects of the circuit. Then we custom-wound a very special output transformer that beats the name brands for low-frequency linearity and distortion performance. Click for more information on our T-84 Circuit Kit for the CAD GXL2200. The GXL2200 is a perfect donor mic to host our top-of-the-line transformerless PCB kit, the MP-V57. This is a full circuit replacement, using uncompromising audiophile parts. Click for more info on the MP-V57 PCB kit.